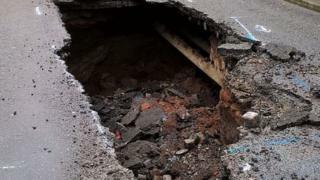 One of the main roads into Liverpool has been closed after a 7m (23ft) deep hole opened up. Liverpool City Council is urging people to avoid Edge Lane after a carriageway collapse closed it in both directions causing concern about a gas main. United Utilities has identified that a brick sewer is blocked under the road. "It's hard to say how long repairs will take until we can actually dig down," said United Utilities wastewater strategy manager Tony Griffiths. He added: "At this stage we don't know what has caused the sewer to block up, it could be ground movement or subsidence. "Our first priority is to make the area safe and set up a bypass pumping system so that wastewater flows can get past the blocked section. "It may then be possible to open the opposite carriageway and set up a contraflow system for traffic while repairs take place. " But he warned: "It's hard to say how long repairs will take until we can actually dig down and fully assess the situation, but it's likely to be weeks rather than days." Edge Lane is a main route into the city centre from the east.